New technologies have been introduced, but texts are still a popular and efficient communication solution. They are very handy when we need to send a quick message to someone when we are on the go, and without access to the internet. There may be some personal, or work related texts that are confidential and we may worry about others reading them, but at the same time, we don’t want to delete them. If you have text messages that you want to keep, making sure that they are not compromised, the apps that we will present are just what you need. In this list, you will find apps that will protect your SMS texts from prying eyes. Even if your friends or family borrows your phone for a while, you won’t need to be concerned about them reading your private messages. Here is a selection of the best Android apps to conceal your SMS texts. ChirpApps has created a simple and effective way to keep your private messages protected. The app looks like a regular calculator, but it is just a cover to keep your private message space concealed from others. There is a fake app name to hide the real functionality of the app. You can also hide the app icon and ensure that only you get access to it. Even if you lose your phone and it falls into the wrong hands, or you simply have to let someone else use it for a moment, your messages will remain private. You can hide your SMS, contacts and MMS from anyone else who may get access to your phone. This app by GalleryVault wil give you peace of mind as it ensures that others can’t read your text messages. The app is one of the best rated solutions in Google Play thanks to its effective performance and great features. You can save all your texts, contacts and call logs in a private space that can only be accessed by you. The app’s icon can be hidden and then you can set up a pin password to access the hidden data. You can also select a ringtone to be notified about calls or messages from the private contacts. You can block certain calls when it is not the bets time to receive them. In addition, if you are in a rush, you can simply shake your phone to hide the Private space. 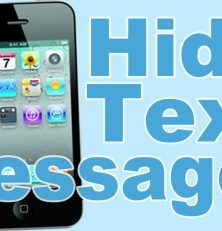 Easy to use and secure, this text hiding solution by ICT Inc is very light and lets you keep your messages protected in case someone takes your phone without your knowledge. Hide SMS lets you keep your messages protected with a password that only you know and it is possible to hide the app’s icon to ensure that no one else can get access to your messages. You can set up a fake notification when you receive a new text. You can protect all the messages that you don’t want others to see and keep private contacts with the help of Private Message Box. The app allows you to save call logs, SMS and MMS from your secret contacts and ensure that they remain hidden using a PIN. You just need to add a contact as Private and once you do that, any messages received from them (as well as the messages you sent them), will be saved within the app. Private Message Box also lets you share messages and emojis with your private contacts. SeconPhone Apps offers another convenient solution to keep your text messages and contacts safeguarded. The app works with Android KitKat, Lollipop and Marshmallow and it lets you manage your private messages effectively. Unlike other SMS hiding apps doesn’t feature a private inbox. Instead, it is designed to make sure that no one else even gets a clue of where to look for your hidden messages. You can select up to 5 contacts to hide, and their messages will also be concealed. The app will be invisible and you can set passwords and secret notifications to enhance the protection of your private data.